Lithograph, tinted with one tint stone, depicting a view of the Bolan Pass, from a series of 26 plates after sketches by James Atkinson. 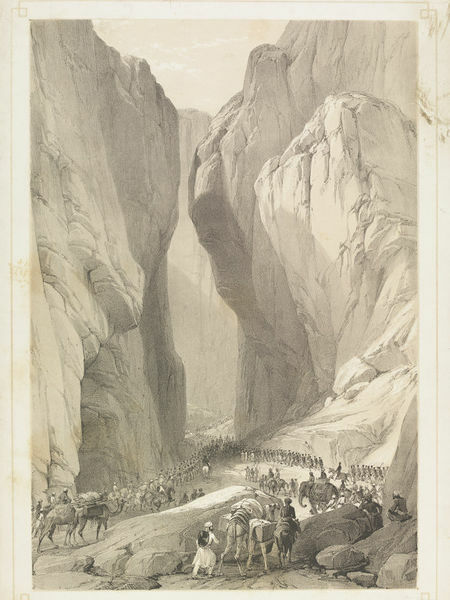 There are streams of infantrymen flowing in orderly lines through the mountain pass, follwed by groups of people riding camels and elephants. The print depicts a period in the First Afghan War, also known as 'Auckland's Folly'. Lettered with title. 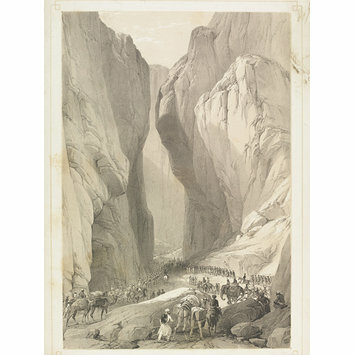 Lithograph after a drawing by James Atkinson entitled 'Entrance to the Bolan Pass from Dadur', engraved by Charles and Louis Haghe. British School, 1842.